This book is one that I have had on my bookshelf since I was 15. I don't exactly remember how it entered my life, but I do know that various people have told me repeatedly over the years to read it. I'm almost ashamed that it took me so long because now that I've finished, I can't believe I waited so long. My twenty-something self loved this book so much, and I know that my 15-year-old self would have been utterly devoted to this book. Just...read it. Cassandra Mortmain and her family live in poverty the ruins of a castle on the English countryside. Cassandra’s father, a brilliant writer who has never been able to replicate the success of his first book, spends his days reading crime novels while the family struggles to make a living without many marketable skills or resources, but with plenty of pluck and optimism. When the Cotton family—American, wealthy, fascinating—arrive in their lives, the Mortmain family is forever changed. Told in Cassandra’s journal entries, I Capture the Castle is as much a family story as it is a record of Cassandra’s coming-of-age. Cassandra carefully depicts her romantic older sister, her quirky stepmother Topaz, and her brilliant, withdrawn father with brutal honesty, and their actions, particularly her sister’s, are what propel the novel. The plot is reminiscent of Jane Austen’s satirical marriage-driven stories, but the perspective that Cassandra lends to the story is refreshingly offbeat. Smith’s whimsical settings and Cassandra’s charming narration belie the darker aspects of the story—unrequited love, poverty, broken hearts, and the stark realization that true love is complicated and not a magic fix. 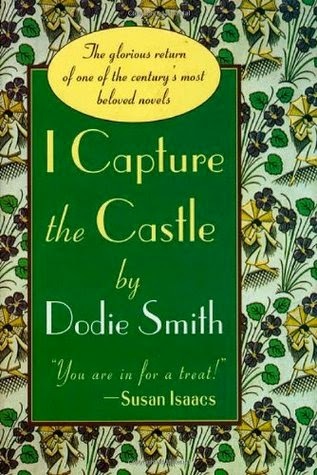 I Capture the Castle is wonderfully witty, completely memorable, emotionally charged, and so realistic that you will forget that it’s a novel. Cover Comments: I feel silly remarking on this cover. It's a reprint--this book was published in 1948 and brought back into print about fifteen years ago. I actually really like the cover pictured--it's very charming, very early 20th century. It fits. But the cover doesn't matter. This book is magical enough that it doesn't need a cover. I absolutely love this book too, and recommend it to many. I think the cover and fact that it is older is what throws people off, but it really IS wonderful! I read this at 16 and it has been an absolute favorite ever since. You captured it perfectly I one word: magical. I'm so glad you finally got to read it and that you loved it!